Built for your expanding family. Easily travel together with 2 infants, 1 toddler and 1 infant, or 2 small toddlers. With the same easy click-in KeyFit attachment as the Cortina stroller, the Together accommodates a car seat in both the front and rear seats. Exclusive forward-fold front seat accepts the KeyFit or KeyFit 30 using exclusive Fold and Click car seat attachment without the need for add-on bars or straps - no more missing pieces! The rear seat has a full recline for bassinet enclosure or to accept an additional car seat. A sleek and modern anodized aluminum frame stroller with a unique tubing profile, the Cortina Together Stroller is 15% lighter than MOST comparably featured double strollers. Other features include Fully-reclining rear seat for bassinet enclosure or car seat attachment, exclusive forward-fold front seat for car seat attachment, convenient one-hand activated fold and automatic storage latch, interchangeable child’s armbar and cupholders, independently adjustable and removable canopies and a zippered basket is accessible even when seat is fully reclined. Weight Limit: up to 40 lbs per seat. I have always been apprehensive of double strollers because of how big and difficult to maneuver they are but I really enjoyed testing this tandem double stroller, I love that it takes less space than side-by-side double strollers and fits through doorways easily. The Cortina Together is a double stroller for busy families on the go. This stroller is ideal for families with twins because it accommodates two KeyFit car seats at the same time and it is also perfect for families that are having a new baby and have older siblings that are still young. The Cortina Together Double Stroller needs to be assembled. No tools are required and the owner’s manual has easy to follow instructions. It took my fiance and sister in law about 10 minutes to assemble the stroller after opening the box, no complaints as everything was clearly illustrated. I received the romantic (black and silver) color to review and I love the way it looks, it’s easy to keep clean too! My sister in law just had a baby boy and has a almost 2 year old so this stroller worked perfectly for her. She found this stroller was easy to fold and unfold and had no issues doing it on her own while holding a newborn. 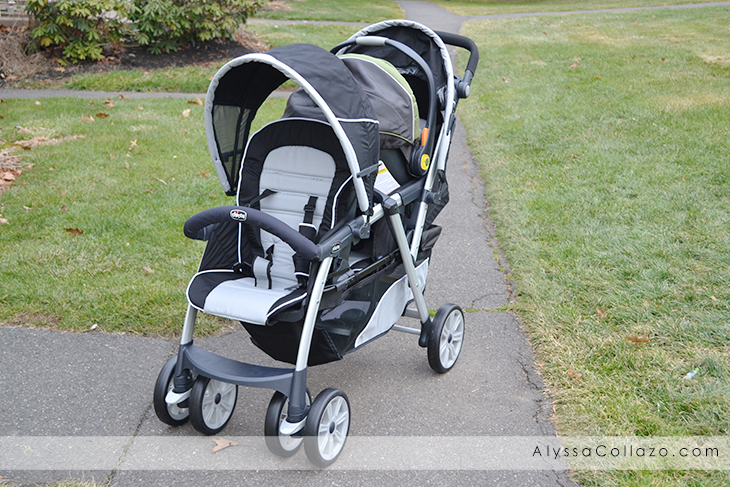 In general this stroller looks and feels solid and the aluminum frame construction is. They have a Ford Edge and they experienced no problems fitting the stroller in the back of the SUV. 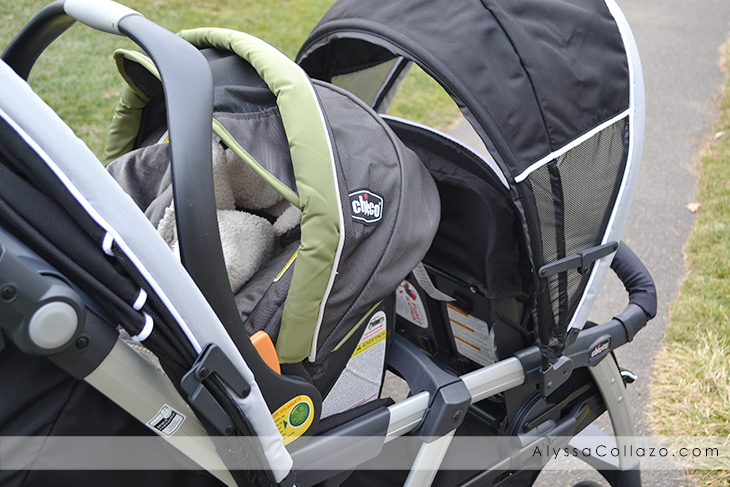 The rear seat of the stroller can be reclined and used as a bassinet enclosure for younger babies. Once the rear backrest is in a full recline position you must reach under the rear seat bottom and pull the leg flap forward to ensure safe occupant retention installation. The front seat also reclines by squeezing the recline handle on the back of the seat and pulling down on front backrest. Both seats are padded and they have a canopy that can shield little ones from the sun. The front seat also has the option to install two handy cup holders (included) instead of a front bar. Both seats feature 5 point safety harness to keep little ones safe while riding. Overall, my sister in law likes the Cortina Together Stroller. It is an ideal double stroller because it is easy to maneuver and it allows both children to recline their seat and adjust it if one or both want to take a nap or stay alert. It has fantastic storage space and it folds and unfolds easily, it is also durable and made to last. I definitively recommend this stroller if you are looking for a stroller for twins or a double stroller for your growing family! The Cortina Together Stroller comes in a few different fashions and can be purchased online at Chicco Shop or at your local Buy Buy Baby and Babies R Us for $299.99. Be sure to follow Chicco on Facebook and YouTube. DISCLAIMER: All products received are complimentary for testing purposes from Chicco. All opinions stated are my own and are not influenced by any affiliates. That looks like a nice, sturdy stroller. I love all the storage space and room you have. I wish I had this stroller when my kids were that small! It looks like a nice, sturdy double stroller. That looks like a great stroller! My first grandbaby is due in July and I'll be the one buying the stroller. Definitely going to check that one out! We have that one! it is a great stroller! This stroller looks more compact than the one I used. My youngest are 16 months apart and I did not like how big twin strollers were. We are looking for a double stroller right now too! This one sounds great! Can't wait to check it out! 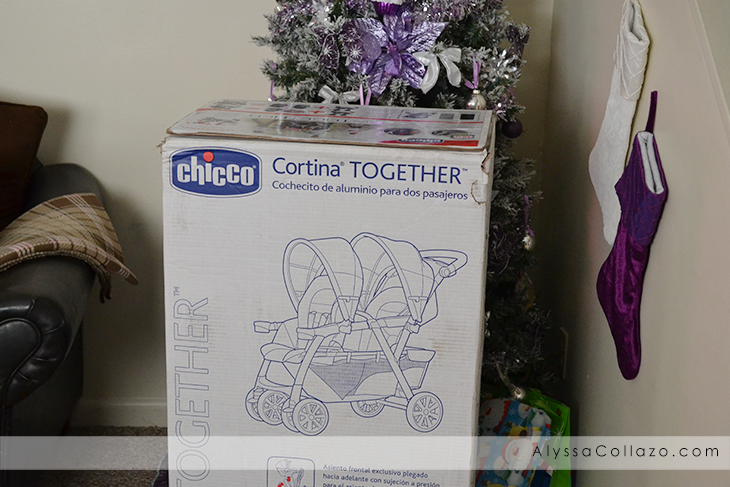 I've never tried a Chicco product and I'm not sure why but now I'm going to! I love trying out different strollers and this sounds like an awesome one to have. I never had to use a double stroller before, that looks like it is nice and roomy as well as comfy. I also like the idea of the storage space and it being sturdy. This looks like such a well-constructed stroller. Any parent would be lucky to have it. This looks like a strong stroller! I haven't got any children at the moment but when I do I'll definitely get one of these! This looks like a great sturdy stroller. It would make a great baby shower gift. This looks like a great stroller. My friend is looking for a new stroller so she can fit both the kids in at tje same time. This one would be perfect for her. This looks like a great stroller, I love the 2 in 1 type of stroller. Looks very durable and very sturdy. I always trust the Chicco brand! This stroller is very functional! I especially appreciate that it is lighter than comparable double strollers. Every little bit helps when you're trying to maneuver with two little ones. This looks like a great stroller. I remember my mom using a double stroller with my sisters. That thing was heavy and a pain. They make stuff so much lighter and easy to use. I would opt for a double stroller if I had a newborn and toddler or twins. Chicco is a trusted brand here in my country. It's what I give my godchildren. And since that stroller is a Chicco, I'm certain that it's durable and safe. That's super cool that the rear can recline to a bassinet feature for the baby. I'd have loved this when I had two little ones together at the same time! I always tell my friends to register for Chicco stuff. It is so durable and lasts forever! I've become so impatient with strollers over the years, as so many are so hard to fold and unfold. Thankfully, this one doesn't sound like the ones I've tried in the past. I love the Chicco stroller. We had twins and this one would have come in handy with them. I love all the new updates. Twins? Welcome to the club!!! I missed Graco 3 years ago but their car seats are great! amazing stroller, this is really good stroller, thanks for posting such wonderful stroller picture. really eventually I've got real resolution from your post. this is often very informative and nice post . i actually wanna this kind of post. thanks for the share with United States. wow! This is pretty much awesome. Love this review!! Thanks for sharing. These images looks cool. I appreciate you making this post available, the remaining part of the website is also high quality. Keep sharing great articles!